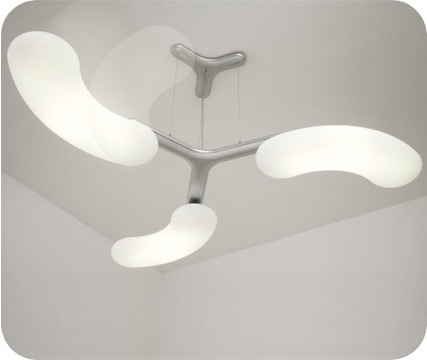 shape changing ,interactive, suspended light. dimensions : minimal 1060 / maximal: 2110 mm. diameter. description : 3 lampshades with individual light-sources are attached to a 3-armed frame. Trough a special mechanic construction the lampshades can be rotated and fixed in 12 different positions. This gives the lamp it's unique ability to transform in shape and size, creating 12 different shapes , sizes, looks and feels. In the starting position: all 3 shades form a 1060 mm diameter circle. As they are fanned out, the lamp gradually changes into a 2110 mm diameter dynamic propeller-shape, before the lamp transforms into a soft, organic triangle shape. Changing the shape also effects the spreading of the light. Give one room 12 different looks using one lamp.